Agenda21@: Fwd: Tyranny on Citizens in VA! Dear All, I had to send in two emails due to limits of gmail account. Subject: Tyranny on Citizens in VA! HB2313 supports Taxaholism and loss of liberty in VA ! This UN Agenda 21 , Sustainable Development Tax Hike is shameful! What is most shameful is the absolute loss of TRUST in our elected public servants as they destroy American Principles of Liberty with this unbearable, unaffordable, unnecessary, unwanted, unconstitutional and outrageous TAX HIKE on struggling Virginia families! Mr. Underwood's following letter speaks for many Virginians! As he correctly points out, if any project is worthy, the "free enterprise" will see it from conception to implementation, without fear of government intrusion! Government officials promote corporate welfare, for re-election purposes, and have all but destroyed this concept via AG21 Public Private Partnerships. VA wins the "GREATEST MISUSE of Taxpayer WEALTH" award, out of all 50 States! Transportation dollars misappropriated to education for Bloated Bureaucracy and securing a voting block! The largest tax hike in VA history is not really about "transportation". It has everything to do with Sustainable Development's UN AG21 control of land use, people control (not the CFR Elitist) and destruction of Capitalism. 1. Transportation Funding problems did not arise as a result of insufficient revenue, it is a result of the General Assembly's inability to budget and to eliminate unnecessary programs. 2. 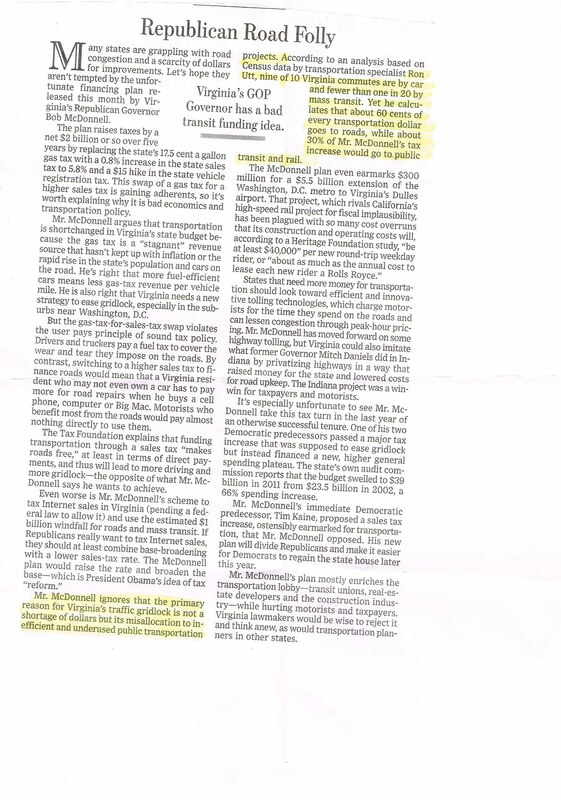 As noted in the attached WSJ Op Ed, only two years ago, in 2011, the General Assembly passed a 66% tax "increase that was supposed to ease gridlock but instead financed a new, higher general spending plateau." So if Transportation is really a priority, First, look for where the added revenue (roughly $15.5 Billion) is really being spent and claw it back to fund Transportation. 3. Use the Funds only for new road construction and maintenance. Eliminate all funding for Mass Transportation. If the private sector wants to have a rapid rail from Washington to Dulles, and thinks that they can do so profitably, let them. It's just not the job of the State to cater to every special interest group. The State should not be picking winners and losers nor encouraging technologies that will benefit only the few (as also reported in the WSJ article, McDonnell would allocate 30% of the new Tax Increase to Public Transit and rail). The Problem is Lack of Funds for Roads, not Rail. 4. It is the Job of the General Assembly to prioritize its allocation of Funds. If you need more money for Transportation (not including mass transit projects that should be only undertaken by private enterprise), then it must be taken from some other part of the budget. I really believe that another tax increase will only lead to a request for even more a year or two later. Please be a spokesman for reason, Kill this bill in your committee. Please note that we are watching, and will certainly note the way you vote on this unjustified tax increase. 5. 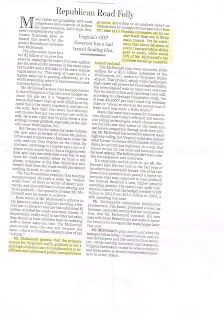 Please read the attached WSJ article. It is short and exposes the absolute folly of increasing taxes yet again.